A blog about the things that I eat. We've been in the kitchen, working hard to whip up a new recipe. We're still sworn to secrecy on the details but wanna send you a free bar to give you a chance to try it before it even gets to the store. 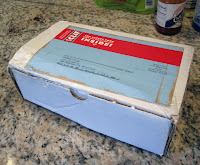 I eat a Clif bar almost every weekday morning, so how could I resist a sneak-peek at a new Clif product? I took the box inside and opened it up. This is where I was immediately disappointed. The new product was something called "Crunch," and my particular sample was "Honey Oat." Thanks, Clif. At least it wasn't made of bacon. I went to the Clif site to see if there were other Crunch flavors. There are: Chocolate Chip, Peanut Butter, and White Chocolate Macadamia. Of all these flavors, only White Chocolate Macadamia is vegan-friendly. The others contain honey, though only Honey Oat is up-front about it. All CLIF Bar products are made from ingredients that do not come from animals except most Mojo and CLIF CRUNCH flavors (contains organic honey), CLIF SHOT ROKS and Luna Protein (contains whey). 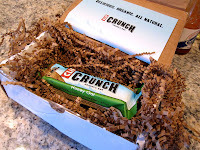 I received my preview Crunch bar today (Honey Oat). I'm vegan, so I was immediately disappointed that it contains honey. I checked your site and learned that three of the other four new flavors contain honey, too. Is this a trend? My vegan friends and I used to appreciate not having to read your labels, confident that your products were friendly. But now you seem to be slipping to the dark side. Update (2010-07-01): I got a response and a vegan bar is on the way!